Rajasthan despite its romantic name and the images it conjours up, is mainly a huge flat plain and rather tedious to drive through. It is the cities which bring the romance to our trip (well so does Gordon, but that’s a story for another blog). The national bird of India is the peacock. You are not allowed to kill them. They are everywhere. They are too big to fly well and can barely make it up into the trees where they perch uneasily on branches that buckle under their weight. But on the ground they are magnificent, the colors of the male flashing beautifully in the sun. Indian women too are magnificent. 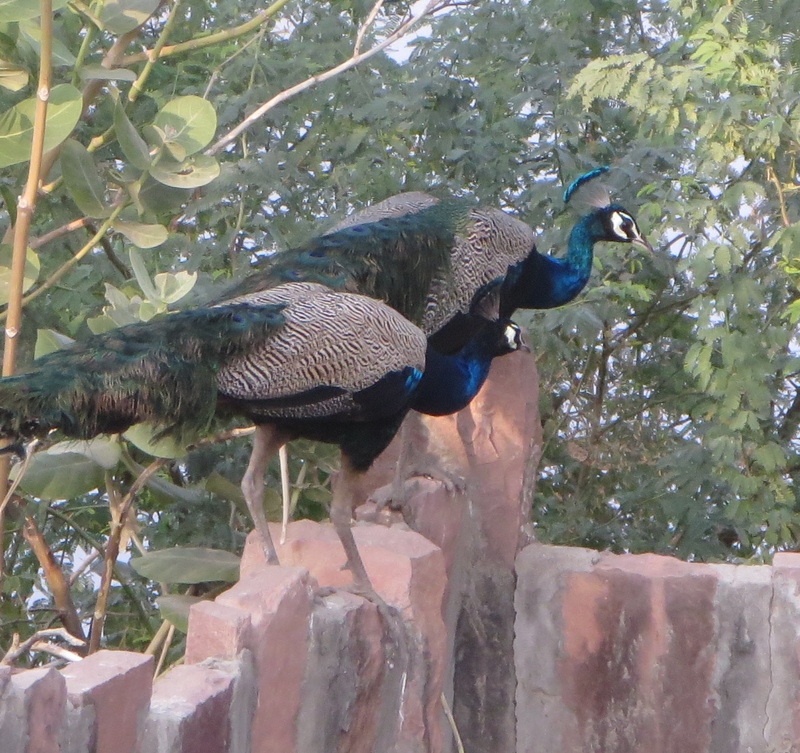 As we pass through town after town, each one drab and dusty, the only thing that brightens them up is the women in their jewel toned saris, which seem to be inspired by the peacock. One other word of warning – be prepared to be stared at. Women rarely make eye contact with us, but all the local men stare at us. They make no effort to hide it, or be friendly, they just stare. As you know dear readers, I love to be the centre of attention, but not quite like this. We realise it is because we are different, but it is not pleasant. I have taken to just smiling back at them. Then some times they will break into a smile and nod their heads like one of those toy dogs in the back window of a car, but other times they won’t. The other behaviour that is hard to deal with is the constant hassle from the shopkeepers. They follow you down the street being charmingly friendly. They always start by asking where you are from. We soon learn that if you answer them you are in trouble. They just don’t stop talking and their sole intention is to get you into their shop. It takes but a day to learn that the only way to deal with them is not to look at them or answer them, just pretend they are not there. To a nicely brought up young man like me, it seems so rude. It may come as a shock to my mother, if no one else, but I discover that I can be rude. Their stores are so small that they can’t display their merchandise. Instead they make you sit on tiny stools a few inches off the floor while they pull item after item off their shelves to show you, seemingly oblivious to whatever it was that drew you into their shop in the first place. The tiny stools serve a dual purpose. Once you are sat on them you are a captive audience, and if you are of a certain age, it is extremely difficult to get up from them and flee. They then offer you tea, coffee, soft drink, water, anything to make you feel beholden. And if you show interest in anything the game is on. A price is quoted, that is always totally ridiculous. But it is just a point from which to bargain. Bargaining is a way of life. Although to westerners it can be extremely irritating it is just how they conduct business. There is no need to be unpleasant, as they never seem to get offended. I soon learn to just tell them the price I am willing to pay and stick to it. Shopping is one of the few occasions where being gay in India is actually helpful. 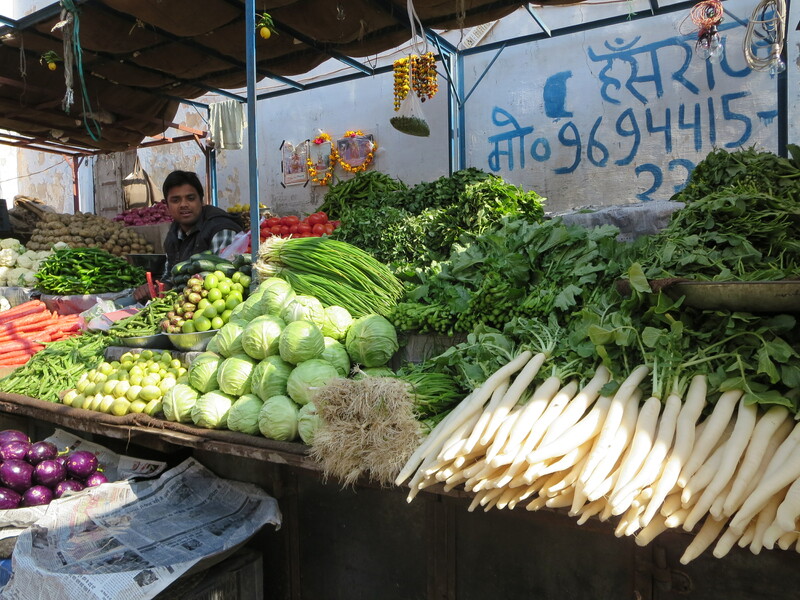 These vendors focus on tourist women, recognising that there is only one shopper per family and that is the woman. When it is two men they are not sure that we are worth the effort. The men of Rajasthan are a complete surprise. They are often tall, well over 6 foot, with a striking presence. But they have yet to learn how to treat their women. The women appear to be just one more animal to be put to work. We never see a woman working in a shop or in a restaurant or hotel. That is men’s work. Even the chamber maids are men, although I hesitate to call them chamber maids. The women do all the hard work. I’m beginning to like it here! 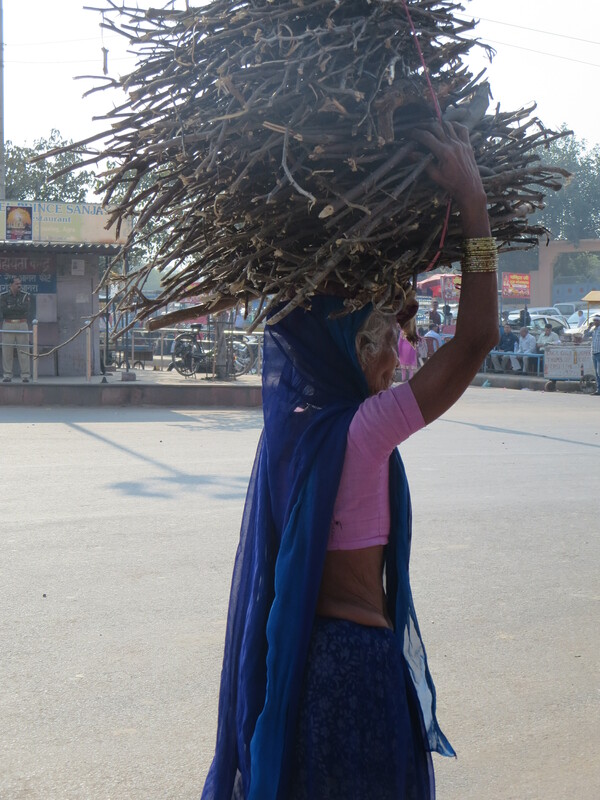 They work in the fields or carry crops and firewood in huge bundles on their heads. They are often seen repairing the roads too. Men and women are rarely seen together. The women travel in groups, as do the men. While the women work, the men can often be found men sitting round drinking masala tea. I’m really liking it here! Indians don’t eat a lot of meat. They don’t eat cows because they are sacred. They don’t eat pigs either. Surprisingly they eat very little chicken, although it is on every menu. But restaurants serve it mainly for the tourists. Indians eat lamb and “mutton”. Mutton seems to be the main meat of choice. We assume it is very old sheep. But in fact it is goat. They just translate it to mutton on the menus, because they know tourists won’t eat goat. We have been warned not to eat meat as their butchering habits leave a lot to be desired. We have seen the meat market in Mumbai and the crows pecking at the meat as it was being butchered. But we still eat it, and as yet neither of us have been sick (We now believe that Gordon’s 48 hour illness at the beginning of the trip was a bug). They also have great salads. My favourite is the green salad, although there is no green involved. It consists of slices of tomato, cucumber and raw onion dressed with spicy lemon juice and served with yoghurt. We have been warned not to eat the salads and not to eat the yoghurt, but they are too good to resist and I eat them every day. The food is very spicy, too spicy for me, and I always ask for very little spice. Unfortunately that is a concept that most Indians do not understand. I have however discovered the delights of all the different nan breads and Afghani chicken which is marinated in melon juice and yoghurt (I think) and often served with chopped cashews. It is delicious. 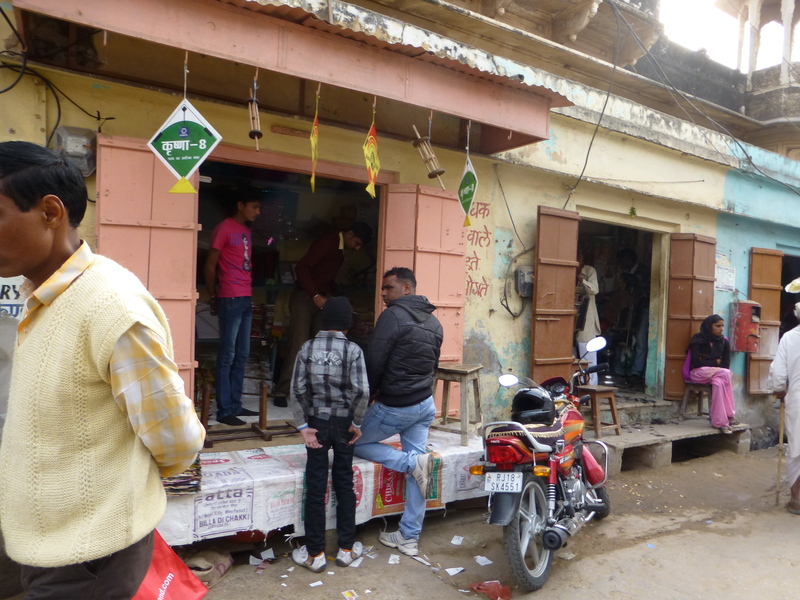 Despite all our preconceptions this area of Rajasthan is remarkably safe. We wander the streets with our cameras in our hands and wallets in our pockets, and we are white. There is no mistaking us for anything but wealthy tourists. We look and dress so differently from the local inhabitants, many of whom are desperately poor, and yet the only problem we ever face is being hopelessly overcharged in the shops. Pickpocketing, or grabbing your camera or jewelry from around your neck, which can be so prevalent elsewhere doesn’t seem to happen here. There are professional beggars mainly outside the temples, but apart from the occasonal tiny boy dressed in rags no one approaches us asking for money. But all this is about to change as we enter the so called Golden Triangle. Not the drug one of Laos, Burma and Thailand but the tourist dollar one of Delhi, Agra and Jaipur. This entry was posted in India and tagged Rajasthan. Bookmark the permalink. 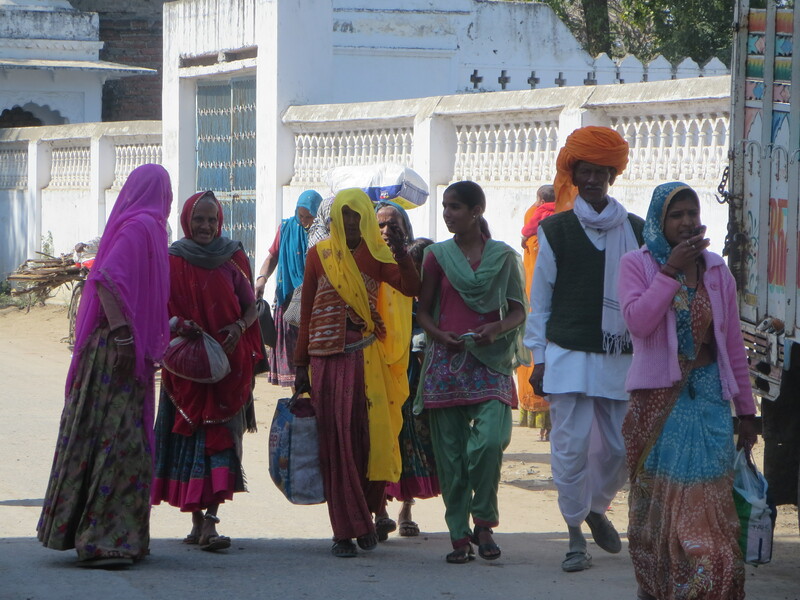 5 Responses to Rajasthan: Image and Reality. Let me just say that many men have made me burn…but I wouldn’t kill myself for any of them. You have discovered you can be rude. Who knew? As you can imagine, it came as a complete surprise to me !